Abstract: "The formation and rapid drainage of supraglacial lakes (SGL) influences the mass balance and dynamics of the Greenland Ice Sheet (GrIS). Although SGLs are expected to spread inland during the 21st century due to atmospheric warming, less is known about their future spatial distribution and volume. We use GrIS surface elevation model and regional climate model outputs to show that at the end of the 21st century (2070-2099) approximately 9.8 ± 3.9 km3 (+113% compared to 1980-2009) and 12.6 ± 5 km3 (+174%) of meltwater could be stored in SGLs under moderate (RCP 4.5) and high (RCP 8.5) climate change scenarios respectively. The largest increase is expected in the north-eastern sector of the GrIS (191% in RCP 4.5 and 320% in RCP 8.5), whereas in west Greenland, where the most SGLs are currently observed, the future increase will be relatively moderate (55% in RCP 4.5 and 68% in RCP 8.5)." GRACE estimates for GIS mass loss are 10% too low because of flawed GIA model. Many usual suspects on the author list. Open access. Read all about it. Accurate quantification of the millennial-scale mass balance of the Greenland ice sheet (GrIS) and its contribution to global sea-level rise remain challenging because of sparse in situ observations in key regions. Glacial isostatic adjustment (GIA) is the ongoing response of the solid Earth to ice and ocean load changes occurring since the Last Glacial Maximum (LGM; ~21 thousand years ago) and may be used to constrain the GrIS deglaciation history. We use data from the Greenland Global Positioning System network to directly measure GIA and estimate basin-wide mass changes since the LGM. Unpredicted, large GIA uplift rates of +12 mm/year are found in southeast Greenland. These rates are due to low upper mantle viscosity in the region, from when Greenland passed over the Iceland hot spot about 40 million years ago. This region of concentrated soft rheology has a profound influence on reconstructing the deglaciation history of Greenland. We reevaluate the evolution of the GrIS since LGM and obtain a loss of 1.5-m sea-level equivalent from the northwest and southeast. These same sectors are dominating modern mass loss. We suggest that the present destabilization of these marine-based sectors may increase sea level for centuries to come. Our new deglaciation history and GIA uplift estimates suggest that studies that use the Gravity Recovery and Climate Experiment satellite mission to infer present-day changes in the GrIS may have erroneously corrected for GIA and underestimated the mass loss by about 20 gigatons/year. At NSIDC there is now an interactive "chartic" style graph for the melting on Greenland - sadly its arrived just when they have stopped recording the melt so we wont catch any surprises in the current weirdly high temperatures. As its real daily data rather than smoothed 5 day data the bands are a bit wide and rugged - so its harder to see what is going on than with the Chartic area/ extent one. http://nsidc.org/greenland-today/greenland-surface-melt-extent-interactive-chart/ - would this be a handy link for the ASI Graphs section ? <snip>We based our project on more than 37,000 optical images collected by multiple sensors aboard the U.S. Geological Survey (USGS) and NASA’s Landsat satellites. The data span the period between 1972, when Landsat 1 was launched, and 2015, using data from Landsat 8 (launched in 2013), although most of the Landsat scenes were acquired after 1998. We will continue to extend the database using new scenes recorded by the ongoing Landsat 7 and 8 missions. The USGS Landsat Global Archive Consolidation (LGAC) will add even more scenes, providing access to Landsat data that are archived at individual international ground stations [Wulder et al., 2016]. For Greenland, this could provide a considerable number of scenes from Landsat 4 and 5, dating back to 1982. These additional images are valuable for extending the time span of the velocity time series. This greater time span is particularly important for inferring flow velocity variations that occur within the span of one season, and it may help to close observation gaps that occurred before 1999, when Landsat 7 was launched. Moreover, in regions of extensive cloud coverage, collecting Landsat scenes over a longer time span increases the chance of obtaining cloud-free data. For 302 glaciers all around Greenland, we have processed more than 100,000 flow velocity fields from 1972 to 2012. We have extended this processing to include velocity fields for about 50 major glaciers up to 2015 so far. By adding a quality flag that indicates the reliability of the data, we reduced the number of existing velocity fields with extensive outliers. We used an outlier detection strategy that compared the differences between each observed velocity product and a theoretically derived velocity field to compile the statistical parameters for our evaluation. Altogether, we have made more than 40,000 flow velocity fields accessible so far, and we continue to add new velocity fields as we process more data. Rosenau et al. described a number of steps included in the processing procedure. 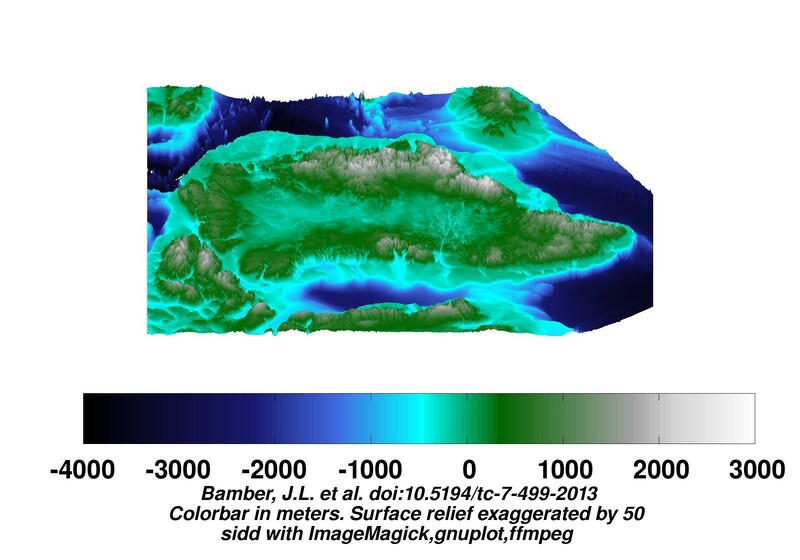 We have improved the correction for tilt and terrain effects (orthorectification) using the Global Digital Elevation Map Version 2 (GDEM V2) from NASA’s Advanced Spaceborne Thermal Emission and Reflection Radiometer (ASTER). The improved orthorectification step, in particular, facilitates the usage of overlapping scenes from orbits that are not repeat passes. The ability to include these additional scenes provides a much higher effective sampling rate than would be provided by repeat-pass sampling, which is limited to the repeat orbit of 16 days (Landsat 4 to 8 ) or 18 days (Landsat 1 to 3). In 2003, a small pair of mirrors (the scan line corrector) aboard Landsat 7 failed, introducing data gaps as well as small shifts between the scan lines. We applied a destriping correction to mitigate the impact on the resulting velocity fields. In addition, we removed outliers using an adaptive, recursive filter approach. The combination of all these improvements leads to higher accuracy of the inferred velocity fields. The long time span covered by the Landsat scenes allows us to determine long-term flow velocity trends. The high temporal resolution lets us analyze seasonal flow velocity variations of numerous outlet glaciers. However, the pattern of temporal and spatial distributions of the flow velocity changes is not uniform (Figure 1). The monitoring system provides a powerful tool to examine the flow velocity pattern throughout time and space, and we have detected an acceleration pattern for a number of outlet glaciers. Wasn't sure where to post this photo of a melt lake on Greenland but decided to post it here. The photo came, not from a science study but as more of an art project. The link to more photos is here. This one interested me because of what it suggests about these melt lakes. The fragmented floes look like something you would see in the CAB during the height of the melt season and suggests that this lake does not freeze completely in the winter. I wonder how many melt lakes are like this? I just found this in today's Washington Post, am not entirely sure where the best place to put it is, and am not sure I know how to link so feel free to move it if I link properly but in a poor area and let me know if the link is bad. A project started by NASA five years ago is starting to pay off. It is called OMG for "Oceans are Melting Greenland" and it is basically trying to see what temperature differentials are doing to underwater glacier masses at various levels. So far ... does not look very good but not enough data has been observed and I doubt that the current administration will allow much more to be collected. Alas, it wasn't started 5 years ago - it started 2 years ago. It was planned to be a 5-year study. Still, the recently published findings mark a start. Morlighem’s study, for instance, looked at the depth and shape of the seafloor near the fronts of and beneath numerous Greenland glaciers. The research shows that numerous glaciers extend deeper beneath the surface of the ocean than previously thought. For instance, Store Glacier in northwestern Greenland (at around 70 degrees North latitude in the image above) starts at 400 meters (around 1,300 feet) deep where its front touches the ocean, and then plunges to depths as high as 1,000 meters deep (3,280 feet) farther inland — making it quite vulnerable to the ocean. Prior research, however, had suggested the glacier was much shallower. The same was true of numerous other glaciers, which also appear more vulnerable than previously thought. Overall, the data are also showing that Greenland’s west coast is far more vulnerable, in general, than its east, Morlighem said. The second study, meanwhile, examines ocean circulation around the Greenland coast and finds, strikingly, that between 68 degrees North latitude along the coast and 77 degrees North (see above), the deepest warm layer of Atlantic water cools from 3.5 degrees Celsius down to 2.5 degrees Celsius. Moreover, it does so in part because the water busily melts away at a large and deep glacier called Upernavik at 73 degrees North, which touches the ocean in 675 meter (over 2,000 foot) deep waters. The cold meltwater from the glacier spills into the ocean and, through mixing, cools the warm Atlantic water somewhat. “The glaciers there are actively losing enough ice, and enough fresh water, that it’s important for the oceanography, and how the water changes as it goes up the west coast of Greenland,” says Willis. That in itself is proof that Greenland is melting quite a lot. The big picture is that NASA’s new data suggest — that’s right — new vulnerabilities. “Overall, together I think these papers suggest that the glaciers as a whole are more vulnerable than we thought they were,” Willis said. He says that, of course, with the aforementioned caveat that NASA is not ready yet to feed the data into a model that actually shows how this could play out over the decades of our future. Is their coastal topography available as a map, or has it been incorporated into any other bedrock/till models?? I've yet to find better detail. Since the OMG study is mapping glacier mouths and according to press reports finding more deep channels underlying more west coast glaciers, I was wondering if they had produced/or are planing to produce an updated coastal topography/bathymetric map. It seems like it would be a first step on which to present the rest of their work. Morlighem, M., E. Rignot, and J.K. Willis. 2016. 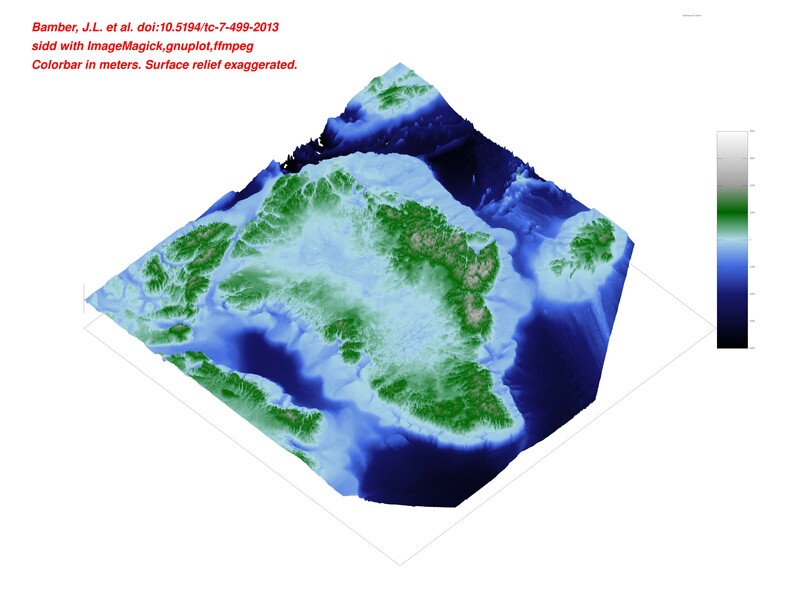 Improving bed topography mapping of Greenland glaciers using NASA’s Oceans Melting Greenland (OMG) data. Oceanography 29(4):62–71, https://doi.org/10.5670/oceanog.2016.99. "Shells from Rocky Bay and Grape Bay populate two distinct temperature ranges. Temperatures in Rocky Bay are 16 to 27°C, ~2°C lower than modern on average, whereas temperatures recorded by Grape Bay shells are 8 to 20°C, averaging ~10°C colder than modern "
"This second sea level rise event likely included contributions from both the Greenland and West Antarctic Ice Sheets [Dutton et al., 2015]. The southern portion of the Greenland Ice Sheet in particular underwent substantial melting between ~122 and ~119 ka [Colville et al., 2011; NEEM Community Members, 2013]. Given the location of Bermuda in the North Atlantic and the time constraints on deposition, it is possible, and perhaps likely, that the meltwater pulse recorded by Grape Bay shells came from rapid melting of the Greenland Ice Sheet." "This possibility makes our results particularly relevant for the future of the North Atlantic. It appears that substantial and rapid melting occurred after thousands of years of sustained interglacial climate, when global ice volume was even smaller than today [Dutton and Lambeck, 2012]." The possibility of MWP1A scale sea level rise is sometimes discounted since the volume of available ice to melt is smaller today. In that context, that last sentence is the killer, " ... when global ice volume was even smaller than today ... "
NSIDC's greenland-today is back online for 2017. No action yet. There has been a tiny bit of action. Look very carefully on Cumulative Melt Days Jan 1 - Apr 11 at bottom SW corner and there are 2 light blue pixels !!! NASA OMG blog by science communicator Laura Faye Tenebaum on Greenland: "A vast melting desert." ".....Over my headset, I can hear the pilots discussing the flight path with the instrument engineers. Out the window, I can see Greenland’s northernmost glaciers below us; white upon white upon white. They sure appear stable, still, enduring. But they’re not. They’re melting..."
I have been wondering how measures are being made/estimated of current Greenland ice melt rates. Can anyone tell me where to look? Please see link below regarding Climate changes clues revealed by ice sheet collapse. Good article Cate. Thanks for the link. I don't get the warm spell forecast for northerly Greenland around May 4-5. The weak low moving in from Baffin doesn't seem to carry much atmospheric moisture, and it's a little early for the sun to have much warming power that far north. Is it some unusual cloud condition causing increased downwelling ILR? If the forecast verifies, attendant surface melt will be quite early for that location. The linked article is entitled: "Early Greenland Melt Spike Possible as Forecast Calls for Temperatures of up to 50 F Above Average". The GIS melt season will likely start early this year. Extract: "Greenland — a region vulnerable to the slings and arrows of human-forced climate change — appears set to experience both considerable warming and a significant melt spike this week. Starting on Wednesday, May 3, a sprawling dome of high pressure is expected to begin to extend westward from the far North Atlantic and out over Iceland. As the high pressure dome builds to 1040 mb over the next couple of days, its clockwise flow will thrust abnormally warm and moist air northward out of the Atlantic. This air-mass is expected first to over-ride eastern Greenland, then run up into Baffin Bay, finally encompassing most of the island and its vast, receding glaciers." .... and it's a little early for the sun to have much warming power that far north. Is it some unusual cloud condition causing increased downwelling ILR? Yes it is early, but solar radiation is equal to early August and with the right atmospheric conditions mentioned by AbruptSLR widespread melt can happen. It typically takes until June because the sun first has to melt all the snow and generally heat the land to freezing temperature. http://nsidc.org/greenland-today/ shows some increased melting May 3 (all on SE quarter coast). Stroeve, J. C., Mioduszewski, J. R., Rennermalm, A., Boisvert, L. N., Tedesco, M., and Robinson, D.: Investigating the Local Scale Influence of Sea Ice on Greenland Surface Melt, The Cryosphere Discuss., doi:10.5194/tc-2017-65, in review, 2017. Abstract. Rapid decline in Arctic sea ice cover in the 21st century may have wide-reaching effects on the Arctic climate system, including the Greenland ice sheet mass balance. Here, we investigate whether local changes in sea ice around the Greenland ice sheet have had an impact on Greenland surface melt. Specifically, we investigate the relationship between sea ice concentration, the timing of melt onset and open water fraction surrounding Greenland with ice sheet surface melt using a combination of remote sensing observations, and outputs from a reanalysis model and a regional climate model for the period 1979–2015. Statistical analysis points to covariability between Greenland ice sheet surface melt and sea ice within Baffin Bay and Davis Strait. While some of this covariance can be explained by simultaneous influence of atmospheric circulation anomalies on both the sea ice cover and Greenland melt, within Baffin Bay we find a modest correlation between detrended melt onset over sea ice and the adjacent ice sheet melt onset. This correlation appears to be related to increased transfer of sensible and latent heat fluxes from the ocean to the atmosphere in early sea ice melt years, increasing temperatures and humidity over the ice sheet that in turn initiate ice sheet melt. High temperatures up to 6.2 C now between Hudson and Baffin bay. With southwestern Greenland still above freezing as well. I found the thread below very interesting. I haven't seen it posted elsewhere. Does anyone know if moulins are a common phenomena? I understood lakes form on top of glaciers, but I did not know about this mechanism for draining. Thanks Magnamentis. excuse my ignorance. In view of rising temperatures in the Arctic, there must be increasing numbers of moulins contributing to the destabilisation of the Greenland ice sheet? Another positive feedback factor? Or am I off track? I would say the main factor is not the moulins themselves but the amount of surface melt and total meltwater. More meltwater will probably lead to more moulins. Surface melt in turn depends on the weather in Greenland which isn't necessarily in lockstep with the whole arctic. Note 2012 was the top year in terms of surface melt over GIS. Thanks oren I was thinking that water drainage through moulins might cause heating of the ice sheet from below leading to destabilisation, in comparison to water that drained straight into the sea. You are indeed right AFAIK. Something to think about, though I've never noticed it being considered, is that much of inland Greenland is well below sea level, I can't imagine any scenario where the salt from the ancient seas that covered it didn't end up in the lowest troughs, once these deposits begin to dissolve the melting temp. of that basal ice will be @ -5C. With more melt above we get more melt below. We know that the ocean has become increasingly saline over time. Do we know how salty the ocean was when Greenland last sank beneath the waves? Since the weight of ice is what pushed the land beneath the waves, and the glaciers are basically fresh snow, would any water now beneath the ice be fresh? observations of the land surface now below the ice suggest that there were river valleys before ice covered the land. If the weight of the ice pushed the land surface below the sea level there would not be salt below the ice. One of the biggest problems is of course that we cannot see through ice perfectly to assess the geology and its chemistry. When ice sheet mass balance changes, this can open old faults and close other ones in bedrocks (these tremors are called ice quakes). A far bigger problem could be if a new fault forms into rock salt containing minerals thus releasing and dissolving salt away, the saline brine might then get flushed out into the subglacial base together with warm water. Has there any hot springs in Greenland to support such a possibility (salt under ice)? Yes, I am enclosing an example of one in Nanortalik. I doubt if anyone has ever measured a correlation of its hot water throughput (flow changes) as linked to nearby glaciers and ice sheet, but I am afraid that these will influence how much hot water comes out from Nanortalik hot spring. Get one Nanortalik-type thing forming under the ice sheet and lots of melting would occur due to hot water and this melting amplified by salt brine. The glacial ice quakes could also start opening or forming deep faults and act like hydraulic press when moving ice opens and closes faults within rocks and in the process pushing water incursions deeper down into the crust and surface of the mantle. This could lead into mud volcanoes up to 10 km depth (i.e. like those forming on the Caspian Sea) in clay based minerals. The olivine group minerals (especially peridotite) within deeper rocks in the crust and on the surface of the mantle may get partially dissolved triggering a re-start of volcanism in the highly volcano-infested South East Greenland (which has so far sat quietly under thickening snow cap even until now despite all the melting already). But as ice thins, the nucleation of gasses in volcanic reservoirs turn them foamy and more voluminous - thus sending magma to the upward trajectory to form magma incursions beneath ice sheet. Further down mantle - and over the wider areas - the conversion of wet solidus into dry solidus can intensify the overall negative pressure of volcanic plume solids (due to disassociation of hydrogen and oxygen from the rock making it lighter like cork or sea ice that float on water and rise upwards towards the surface). The problem overall is the more aggressively we disturb Greenland Ice Sheet the more complex the possible processes become. But volcanism can become a major cause of sudden ice sheet loss once enough nucleation and disequilibrium and new faults in bed rocks form. I suspect that the Pine Island Glacier (PIG) might have hot water or magma incursions beneath ice - fed by the growing disequilibrium between ablating WAIS and accumulating EAIS both causing fluid displacements from higher pressure areas to the lower pressure areas, and wet solidus damage under whole of WAIS with localized pockets of ablation-induced nucleation of gases in volcanic reservoirs sitting beneath PIG. Greenland similar things could also happen. Grimsvotn under Vatnajokull in nearby Iceland is a result of ablation-induced nucleation also Eyjafjallajokull. Tedstone, A. J., Bamber, J. L., Cook, J. M., Williamson, C. J., Fettweis, X., Hodson, A. J., and Tranter, M.: Dark ice dynamics of the south-west Greenland Ice Sheet, The Cryosphere Discuss., doi:10.5194/tc-2017-79, in review, 2017. Abstract. Runoff from the Greenland Ice Sheet (GrIS) has increased in recent years due largely to declining albedo and enhanced surface melting. Some of the largest declines in GrIS albedo have occurred in the ablation zone of the south-west sector and are associated with the development of 'dark' ice surfaces. Field observations at local scales reveal that a variety of light-absorbing impurities (LAIs) can be present on the surface, ranging from inorganic particulates, to cryoconite materials and ice algae. Meanwhile, satellite observations show that the areal extent of dark ice has varied significantly between recent successive melt seasons. However, the processes that drive such large inter-annual variability in dark ice extent remain essentially unconstrained. At present we are therefore unable to project how the albedo of bare-ice sectors of the GrIS will evolve, causing uncertainty in the projected sea level contribution from the GrIS over the coming decades. Here we use MODIS satellite imagery to examine dark ice dynamics on the south-west GrIS each year from 2000 to 2016. We quantify dark ice in terms of its annual extent, duration, intensity and timing of first appearance. Not only does dark ice extent vary significantly between years, but so too does its duration (from 0 % to > 80 % of June–July–August, JJA), intensity and the timing of its first appearance. Comparison of dark ice dynamics with potential meteorological drivers from the regional climate model MAR reveals that the JJA sensible heat flux, the number of positive minimum-air-temperature days and the timing of bare ice appearance are significant inter-annual synoptic controls. We use these findings to identify the surface processes which are most likely to explain recent dark ice dynamics.We suggest that whilst the spatial distribution of dark ice is best explained by outcropping of particulates from ablating ice, these particulates alone do not drive dark ice dynamics. Instead, they may enable the growth of pigmented ice algal assemblages which cause visible surface darkening, but only when the climatological pre-requisites of liquid meltwater presence and sufficient photosynthetically-active radiation fluxes are met. Further field studies are required to fully constrain the processes by which ice algae growth proceeds and the apparent dependency of algae growth on melt-out particulates. Much of Greenland is billion year plus old pre-Cambrian shield. In southern Greenland the Iceland hot spot track is associated with relatively recent voluminous volcanism. Salt is not generally found in these types of rocks. Peridotite may serpentinize under near surface conditions in the presence of water, but it has a very high melting point. Olivine has such a high melting point that it tends to form cumulates in the bottom of magma chambers. Olivine crystals sink to to bottom of magma chambers. The magnesium end member of the olivine group was one of the first solids to form out of the solar nebula. It has a ridiculously high melting point. Peridotites form from very hot volcanic systems. Depressurizing an existing volcano can lead to additional magma production but it will not reactivate old dead systems that have solidified. So we might see glacial unloading increase Icelandic volcanism but it won't revive dead volcanoes in Greenland. Greenland melting quite high 18th & 19th May- especially on SW coast. Does Greenland Melting Season deserve a thread of its own? You guys are amazing. I learn so much here.